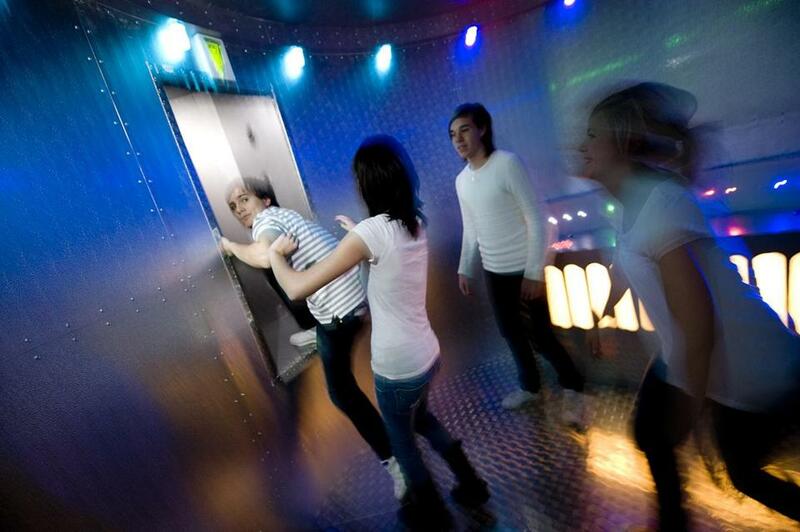 Visitors at play in one of the quest rooms of Boda Borg Oxelosund in Sweden. MALDEN — Your team has completed its first challenge. You open a door into the next dimly lit room. Inside: what appears to be a barn. Stalls for animals line the walls. Issuing from somewhere, the sound of . . . pigs. What do you do? “What kind of noise is that?” asks Chad Ellis, the mad scientist, game master, and CEO behind Boda Borg Boston. “That’s a pig,” says a fellow team member. The clock is ticking. “Those look like buttons,” says the third, spotting round disks lit with pictures of animals. “OK, let’s try that,” Ellis hints. The team exits the room and spills into the hallway. Soon, they’re discussing how to solve this quest called “Farm” — as well as, uh, what exactly they’re supposed to be solving in the first place. With new ideas and determination, the team pushes through the black door again. “One more time,” says Ellis. Boda Borg Boston is a place where completing “quests” isn’t the only challenge. One is explaining what goes on there. Recently, a reporter was given a sneak peek of the new facility, which opens its doors Saturday in the building that once housed Sparks department store, a downtown Malden landmark. To bring this “reality gaming” center to the Boston area, Ellis spent close to $4 million renovating the 30,000-square-foot space. Inside, there’s a sleek reception area, a taco restaurant that seats 150, and space upstairs for corporate retreats and birthday parties. But downstairs is the heart of Boda Borg, what Ellis calls “the maze of craziness”: a warren of black-painted hallways leading to 16 real-time,live-action puzzles, or what the company calls “quests.” They await teams of three to five players, who must figure each one out. Boda Borg is no Dungeons & Dragons fantasy game, nor is it a haunted house with ghouls. Still, guests should bring a sense of adventure and be prepared for befuddlement. Being stumped by any quest on the first attempt — or 21st — is expected. “We don’t sell success. We sell failure,” says David Spigner, CEO of Boda Borg Corp. In business since the mid-1990s, Boda Borg runs seven other locations in Sweden and one in Ireland. The Malden franchise is the Swedish company’s first US venture. Details of each challenge must be shrouded in secrecy — if a guest knows too much, what’s the point in questing? — so a reporter is asked not to reveal any spoilers. “We sell the unknown,” Spigner interjects. What is known, and what Boda Borg is willing to reveal, is this: Each quest has from two to five challenges, requiring some combination of mental acuity, hand-eye coordination, and feats of physical strength. 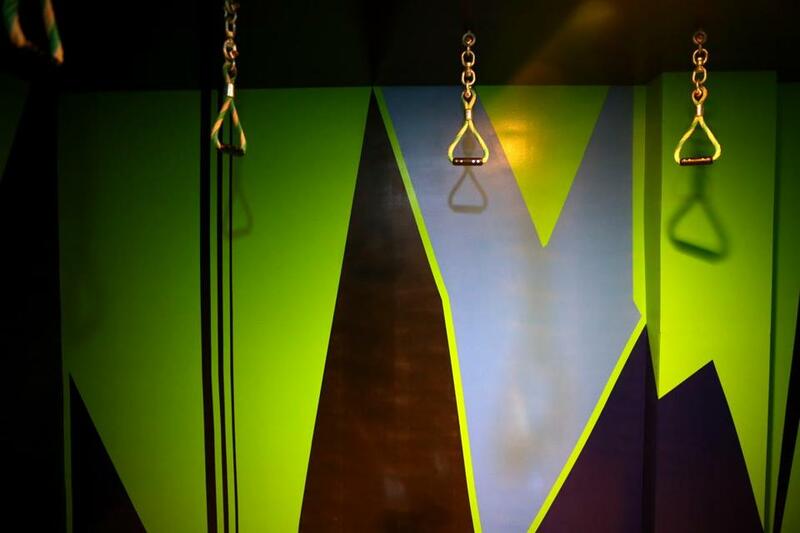 There are ropes to pull, monkey bars to hang from, and riddles to solve. Hidden sensors placed throughout the rooms monitor each team’s progress. There’s a time limit to complete each challenge, but players don’t know how long they have. Solving one challenge opens the door to the next one; flunk and you’re shown the exit. But no one tells teams why they failed. A worker put the finishing touches on a gaming room at Boda Borg Boston. “If you fail, you’re out and you can start that level again,” says Ellis, 48, of Brookline, who compares questing to “being inside a video game.” But aside from small screens displaying red and green symbols to signal if a team has succeeded or failed, Boda Borg Boston is remarkably tech-free. Ellis is capitalizing on the trend of “reality games,” which includes room escapes (where participants, locked in a room, must find clues to discover the way out) and puzzle hunts. The genre overlaps with interactive theater, obstacle courses, as well as live-action role-playing. All of which reflect at least a momentary weariness with virtual life, and a desire for real world, non-digital gaming experiences. Ellis says 300 people can walk in the door, and start questing. He hopes to attract more than 100,000 guests a year. Ellis, a self-described gamer and “huge geek,” cofounded the board game company Your Move Games and received his MBA from the Harvard Business School. Looking for investors and franchise partners for Boda Borg, fellow Harvard MBA-er Spigner reached out to Ellis. After many conversations, Ellis wanted to open his own location. After questing with Spigner on a trip to Sweden, Ellis was converted. This summer, Ellis returned to Sweden with his management team to spend a week “training in all things Boda Borg.” His wife and kids also joined them. The family quested past midnight. “There are so few things you can do with your kids where you’re really doing it all together,” Ellis says. “We don’t have any challenges [that aren’t] fair for an 8-year-old.” Kids excel at “crawling through little passageways” and figuring “counterintuitive” puzzles. Figure out all 16 quests and you’re anointed a “Quest Master.” But it takes a while to earn that title. “If you get through three or four in two hours, that would be a good result,” says Ellis, continuing the tour through the hardest quests. That includes “Superbanan,” one of the most difficult of Boda Borg’s quests. “Most never complete it.” That includes Ellis. The gaming rooms have different names such as Alcatraz, Pirates, Pipe Room, and Jungle. Ethan Gilsdorf can be reached at www.ethangilsdorf.com and on Twitter @ethanfreak.